Let’s start with the witch trial connection. In 1692 Joseph Marble, resident of Andover, posted bond for his two nieces accused of witchcraft. Abigail Faulkner, his wife’s sister and their mother, had already been convicted of witchcraft and sentenced to be hanged. Her execution was deferred because she was pregnant. By the spring of 1693 the witch hunt frenzy was over. Abigail was pardoned, her daughters never brought to trial. Subsequently, records show Joseph Marble buying 140 acres of land in Sudbury in 1704. Exactly what land Joseph bought and from whom has not been researched, but a good guess is from William Brown and at the northeast border of what is now Maynard. When Stow incorporated in 1683 this section remained part of Sudbury (Joseph is recorded as attending Sudbury town meetings). Not until 1730 did Joseph’s son John Marble and his neighbors successfully petition to switch their land to Stow. In 1871 the same land was included in the creation of Maynard. Thus, over the years the Marble/Whiney/Parmenter homestead was part of three towns, and connected to Marble family history, Whitney family history and Parmenter family history. All three of these historic New England families immigrated from England during the 1630's as part of the "Great Migration." The Marble family line at the homestead was as follows: starting some time after 1704 with Joseph Marble, then his son John, John’s son John, and that John’s son John. John-the-last is buried in Glendale cemetery with his wife Lois. Their daughter Sarah Marble married Daniel Whitney and they inherited the house. Their daughter Mary Whitney married Joel Parmenter. Mary and Joel lived in Sudbury until Daniel Whitney died in 1871, then back to the homestead, making it the Parmenter house until Joel died in 1919. Mary’s and Joel’s son Harry owned half of the house and none of the farm by the time the house burned to the ground in 1924. The house was never rebuilt and the barns (spared by the fire) are long gone. The land is owned by the town of Maynard. A few highlights: The original immigrants John and Judith Marble, John and Elinor Whitney and John and Briget Parmenter all arrived in New England in the 1630’s as part of the Puritan Great Migration. Joseph’s “witch” sister-in-law gave birth to Ammi Ruhamah Faulkner in 1693. His name was derived from Hebrew and translates as “my people have been saved” – apt for a child who’s pregnancy saved his mother’s life! Around 1740 Ammi moved to South Acton and bought the mill. His home is now the historic Faulkner Homestead. His first cousin John Marble was already in residence at the Marble homestead, a mile down the road. The Stow Lower Village Cemetery is full of Whitneys, including Daniel Whitney’s great-grandfather Richard Whitney, Richard’s wife Hannah, and Richard’s second wife, also Hannah. They are lined up Richard, Hannah #1, Hannah #2. Our local Whitneys were related to all the famous Whitneys: Eli Whitney, Whitney museum, horse-racing Whitneys, owner-of-the-Mets Whitneys… Joel Parmenter bought his way out of the Civil War draft, but his great-grandfather Deliverance Jr. fought in the Revolutionary War and his grandsons Joel F. Parmenter and Daniel L. Parmenter served in the U.S. Army in WWI and are listed on the monument in Maynard’s Memorial Park. What Maynard owns is a 28’ x 32’ house foundation and surrounding property of what was one of the first households in Maynard. Granite steps descend into what had been the basement. The Marble family had built an imposing, Georgian colonial style house plus large horse barns. 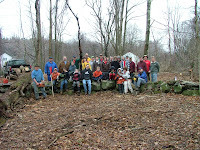 In April 2009 Maynard’s Boy Scout Troop #130 cleared the site and installed a post and chain fence. This was an Eagle Scout project by Jason Schomacker. A plaque at the site shows an undated photo of the house and barns. The site borders the future Assabet River Rail Trail. With good hiking shoes it is possible to walk 0.8 miles on the trail from Maplebrook Park (south end of Maple Street) to the farm site. Or drive to Rockland Avenue and park in the driveway of the boarded-up white house, just past the site. Behind the story: In January 2010 the Maynard Historical Society newsletter published an expanded (4000 word) version of this history. The long version is also in the 2011 book "MAYNARD: History and Life Outdoors" (available via Amazon). Visit the site during daffodil season for an additional treat! Also see May 2013: "Water - How Much to Drink?" This article is about the perils of overhydration - rarer than dehydration - but with its own adverse consequences. DO plan to drink during any endurance event such as a 100 mile (century) bicycle ride. Under warm & dry conditions an athlete can lose a quart (two pounds) of water an hour. According to a study by T.D. Noakes, of 2,135 athletes completing endurance events found that 50% were dehydrated at the finish, defined in the study as having lost more than 3% of pre-event body weight. [Proc Natl Acad Sci 2005;102:18550-55]. Weight losses of up to 2% are not expected to affect performance. Long training rides can be used to learn how much to drink to keep weight loss in the 0% to 2% range. There does not appear to be any advantage to pre-loading fluids before the start, and not doing so may save you time lost waiting in line at the Port-O-Potties at the first rest stop of a century. Be mindful that lack of urine production is not necessarily a sure sign of dehydration (see below). DON'T overhydrate before, during, or after the ride. The popular dogma is “Drink before you are thirsty.” The dogma is wrong and potentially dangerous. With today’s cult of hydration, 5% to 20% of people completing endurance events will weigh more at the end than when they started! Studies have shown that when athletes drink to satisfy thirst they tend to replace only about 75% of the water they are losing during the endurance event. This, rather than drinking to not lose any weight, appears to be the safer target. Full recovery from the mild, event-related dehydration will take place after the event is over. Overhydrating, measurable as gaining weight during the course of the event, does not improve performance. The health risk from overhydration is that it lowers sodium concentration in the blood. The scientific term for this is hyponatremia. In that study mentioned above, 10% of the athletes had gained weight by the end of the event, 3% had blood sodium below the normal range, and 1% had symptoms associated with low sodium. While puffy hands and ankles are not a serious health problem, swelling of the brain is! The problem here is that the brain is encased in a rigid container – the skull – and cannot expand. From mild to severe, the signs and symptoms of overhydration can include one or more of the following: headache, nausea, puffiness (face, ankles, hands), dizziness, confusion, agitation, vomiting, respiratory distress, stupor, coma, seizures, and (very, very rarely) death. Sports drinks do not contain enough sodium to prevent hyponatremia. Contributing to the incidence of overhydration is that fact that for some people, prolonged exercise turns off urine production even if they are overhydrated. The effect can continue for hours after exercise stopped. Thinking that “No pee” means dehydration, these people continue drinking water and sports drinks in an attempt to trigger urine production. The best protection is to check post-event weight against pre-event weight, and not drink anything more than small amounts of fluids if you are heavier afterwards compared to before. The International Marathon Medical Directors Association recommends athletes drink to satisfy thirst. The IMMDA also recommends that for marathon participants any post-event weight gain constitutes justification for a medical consultation. [Clin J Sport Med 2006;16:283-92]. The same thinking would apply to bicyclists.